Hi everyone! I’m Mique from Thirty Handmade Days and the Queen Bee Market. I love creating printables, recipes and gift ideas (like this Anniversary On the Hour– still one of my favorites!). 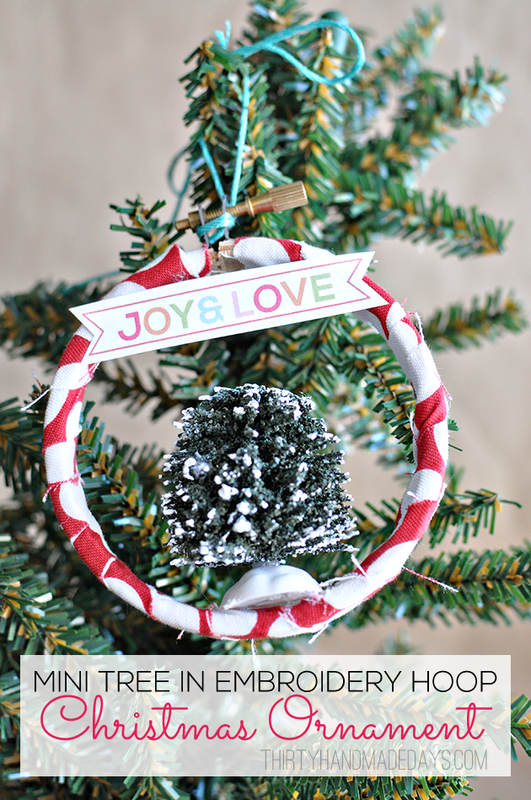 I’m excited to share a simple little ornament with you today. I love bright colors and printables. I combined those two loves for this ornament. Cut a strip of fabric to cover the outside of the embroidery hoop. Make a small dot of glue with your glue gun and secure your fabric at the top of the hoop. Wrap the fabric around the hoop until you reach the other side and secure with another small dot of glue. Make a line of glue on both the bottom of your mini tree and the bottom of the covered embroidery hoop. Print the ornament words and cut out. Glue wherever you want on the embroidery hoop. Attach a piece of embroidery floss or ribbon to hang the ornament. Annnnnnd you’re done! Couldn’t get much simpler, right? Thanks Kari and Becky for letting me hang out and share this ornament with you. Wishing you all a wonderful holiday season! Mique I have a major thing for embroidery hoops and I love your ornament!! Thanks so much for being our guest today! !